Staying fit is an important part of any active outdoor routine. You need to be able to have the strength and endurance that can propel you up mountains and help you lift your own weight onto a paddle board or over a cliff top. And building muscle is one of the building blocks to that successful outdoor routine. 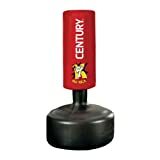 I think that maintaining good upper body strength is one of the top things that active people need to do, and using a home punching bag is one of the easiest ways to do that. 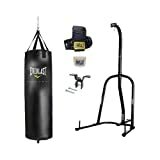 What Size Heavy Bag Should I Get? What Is The Heavy Bag Filled With? Does The Exterior Covering Matter? Should You Buy An Un-filled Punching Bag? Stitched vs Zippered Punching Bags – Does It Matter? How Much Space Do You Need For A Punching Bag? Final Verdict: Don’t Forget The Gloves! If you’re into any type of fight training, like boxing or muay thai, then you already know that one of these is a necessity for training. 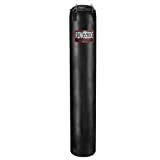 In addition to that, using a punching bag in your home gym gives you a good cardio workout as well as a strength training workout. And if you’re doing some fight training, then you’ll notice that it improves your speed when it comes to striking. You’ll also notice that regular workouts with your punching bag at home will help to improve your coordination and your core stability. This is definitely something that will benefit stand up paddle boarders and surfers! One of the things that I really like about using a heavy punching back for workouts is that you can strengthen and tone your arms (punching) and your legs (kickboxing) with just one piece of equipment. I think this is a great workout equipment choice if you don’t have a lot of space and can only choose one big piece of equipment to add to your home gym. Plus, this is a great way to stay active when the weather outside is too wet or too cold for you to head out on your hardtail mtb or to lace up those hiking boots with the ladies. 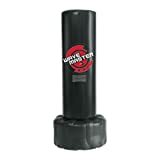 And, compared to most home gym equipment, punching bags are cheap. And if you’re interesting in losing weight, then you’ll love that using a punching bag can be a great way to burn calories and lose weight. 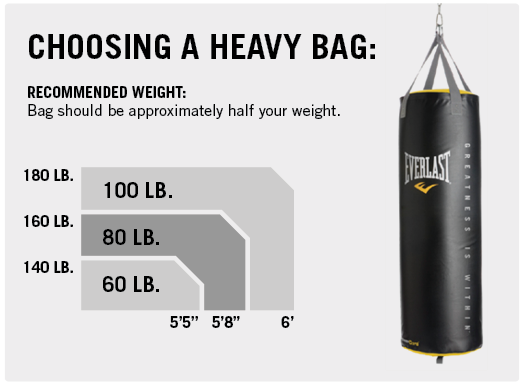 If you’ve only ever used a heavy bag at your local gym, then you might not know what you need to buy for home use. So, if you’re ready to unleash that raw strength and power on a bag at home, use the tips below to get the correct bag for your workouts. First things first, Rocky, don’t go out and buy the heaviest bag you can find. Alternatively, you don’t want to get one that too light either. A good rule of thumb is never buy a heavy bag under 80 pounds, cause if you do, it will likely swing freely, which you don’t want. 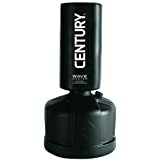 You want a punching bag that sways a little when you hit it, but not too much because you need some resistance there to build your strength. While you might be daydreaming about hanging that punching bag from the ceiling and looking like a badass when you land you kicks on it, the truth is that you should avoid bags that need to be hung. Otherwise, you’ll just end up damaging the ceiling and the floor of whatever is above you. Instead, get yourself a bag stand – and not one of those water stands, but a proper stand that is reliable and will securely hold that heavy bag in place. 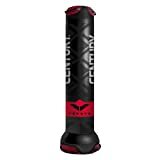 Commando Boxing notes that hard fill is a shredded fiber fill enclosed in a 1″ closed cell foam liner. And soft fill bags that have slightly more give as they are enclosed in a 2″ liner. And obviously, water filled bags are filled with water. The reason that you need to pay attention to the fill type is because it is responsible for the stiffness of the bag, how well it holds its shape, and the effects of using the bag have on your body. The hard fill bag is going to have the least amount of give and be the hardest on your body. It will be very solid and hold its shape well, giving both your bones and your joints a workout. The soft fill bag has a bit more give than the hard fill, which means it is easier on your hands, bones, and joints. The water fill bag has the most give and is the easiest on your joints, but it still does manage to hold its shape during a workout session. As you shop, you will notice that you can buy bags with a covering of leather, canvas, or vinyl. You should definitely avoid the cheap vinyl options because they won’t last you that long before cracking. Since you’ll be punching and kicking the crap out of this thing, you need something that can withstand that type of beating for years to come. Both leather and canvas are designed with this in mind. Buying a bag that you have to fill yourself is really just a matter of personal preference. If you do decide to go this route, then you need to think about what you will use to fill the bag. Definitely avoid using sand to fill a punching bag because it will feel as hard as a rock when you punch it. Instead, use something like beans, wood pellets, rubber mulch or other materials have have some give to them. Unless you are filling the bag yourself, it really doesn’t matter if it has a zipper or if it is stitched. However, if you are going to be filling it, then definitely go with a zippered option because it will be easier for you. 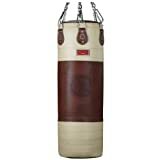 All you need is enough room to move around the bag with punches and kicks at a comfortable distance. This means that some people will need more space than others. Now that you know how to find the perfect heavy bag for your home training needs, remember to get yourself a proper set of punching gloves, or mitts. You don’t want to end up with a hand injury, so skip the cheap gloves and get yourself some quality leather gloves. They will last you for years to come and offer good protection for your hands. Whereas the cheap ones will just end up disintegrating before you know it. Also, hand wraps are crucial here. Just stay consistent with the wraps and spread them out over the knuckles to the first finger.